This month we stocked up on a bunch of stuff from the Fremont BARF Co-op, including some beef pancreas, pork ears, pork liver, beef liver, and 10 lbs. of turkey necks. We also got some plain yogurt and string cheese from the grocery store. More supplements suggested by the vet: Valerian Root, Vitamin B12, Vitamin E, Quercetin, and Colostrum. 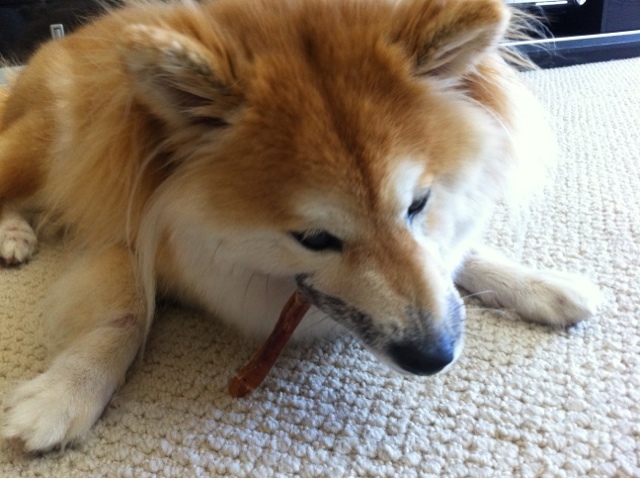 We got a bag of 50 bully sticks while it was on sale. I was a bit disappointed, as I thought the bully sticks could last longer, but Maya was able to finish one within 2 minutes. I guess chewy, yummy and long lasting do not coexist. 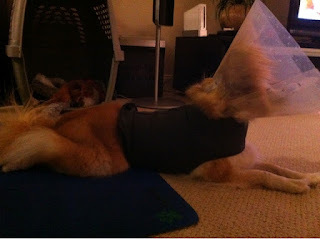 We got a Thundershirt in hope that it'll stop Maya from scratching, but too bad it didn't work. Just when I was about to return it, Maya learned some super yoga pose and was able to stick her back legs into the cone, so sometimes we'll have to use the Thundershirt plus a cone to kind of restrict her movements. The Thundershit should be around $40 plus tax, but Maya got a Petsmart giftcard, so we paid $20 less. A few weeks ago, we bit the bullet and got ourselves a Dyson vacum cleaner. Yes, it's super expensive, but I have to say, I agree with the numerous reviewers, it's worth every penny! Along with the vacum, we also got an extra Pet Grooming / Clean Up Kit. We were only planning to get the Grooming Tool, but the entire kit was cheaper, so we got that instead. Though I made up my mind to get the vacum after seeing Maya shiba-shaking her hair everywhere, it's probably not fair to count the whole thing as a pet expense, so I'll just list the extra kit here, as I definitely would not get that if I don't have a pet.